‘Pakistan Zindabad’ (‘Long live Pakistan’) – at a glance, it’s like any other classic, nationalist slogan. But how does nationalism manifest itself in Pakistan, and how does it infiltrate into people’s daily lives? GSBTB Communications Assistant Abeera Atif recalls encountering nationalism in Pakistan, the rift between traditional expectations and changing times, and how people are alienated if they don’t fit into the mould of a ‘model Pakistani’. My earliest recollection of being part of something – or being told to take part in something – dates all the way back to when I was in first grade. Every morning our entire school would congregate in the grounds for a 15-minute period fittingly called “assembly”. These would usually consist of small updates about our school, a presentation by some 5th grade kids on an “interesting” science project, or an uncomfortable moment of silence whenever tragedy struck, which it often did in a country like Pakistan. For us, however, it was mostly a chance to gab with our friends while we waited for the daily monotony of classes to start. But among these memories, the most persistent is of the phys-ed teacher’s voice blaring across the field: “Attention!” This was the signal for us to stand completely straight, arms at our sides, and sing the national anthem at the top of our lungs, every day, for 15 years. 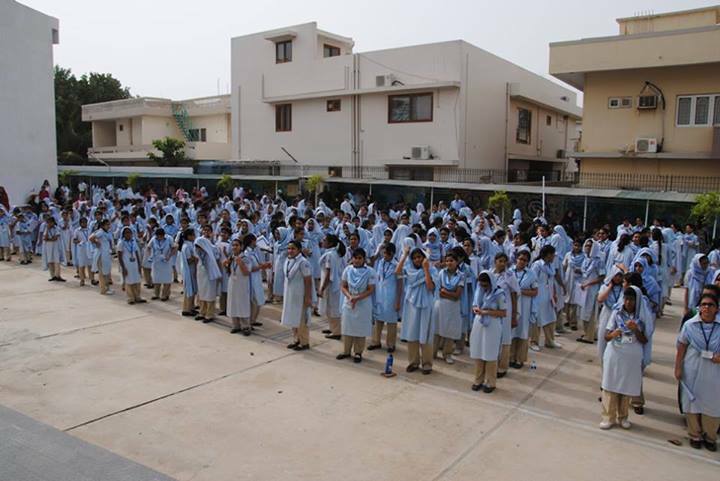 A school assembly at a public school in Pakistan. Source: Wikimedia Commons. Jingoistic rhetoric in Pakistan is not just prevalent, it’s almost expected, as if to be a dutiful citizen you must love your country unconditionally. What strikes me the most about us singing the national anthem everyday is that it’s not even in Urdu, our national language; it’s written in so–called “Persianised Urdu”. It’s practically Farsi. Still, most Pakistanis do not seem to see the irony in singing an anthem with words they cannot understand – or properly pronounce – while simultaneously snubbing efforts to create ties with actual native Farsi speakers. Devil’s advocates would point out that this is due to the literary tradition of revered Pakistani poets, authors and philosophers routinely flitting between Persian, Urdu, and Hindi – a testament to the sprawling, mixed society of old Mughal times, divided by the lasting effects of British colonisation. To me, that exact legacy makes it an odd choice. Pakistan’s relations with its Iranian neighbours are terse at best, sectarian rifts making any friendly cooperation quite unlikely. (Note: Iran’s population consists of Shi’ite Muslims, while Pakistan has a majority of Sunni Muslims). Those from collectivist societies like ours can probably attest to an innate desire to group together. It’s part of our nature and nurture. At the micro-level, this means families are often large, intricate, and extremely intertwined. At the macro-level, this means that people treat their birthplace as the main marker of their identity, preferring to belong rather than stand out as an individual. 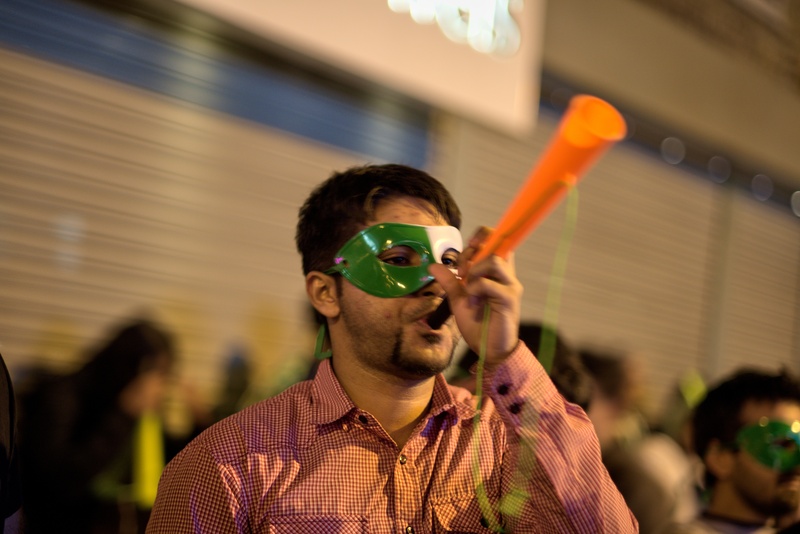 A man wearing a mask with the Pakistani flag colours on Independence Day. Source: Wikimedia Commons. In her paper ‘When In Rome – An Evolutionary Perspective on Community’, Julie C. Coultas aptly writes, “For an individual joining a group, copying the behaviour of the majority would then be a sensible, adaptive behaviour. A conformist tendency would facilitate acceptance into the group and would probably lead to survival if it involved the decision, for instance, to choose between a nutritious or poisonous food, based on copying the behaviour of the majority.” I find the aspect of conformity she touches upon really interesting. Back home, it’s not enough to simply be born in Pakistan. No, you have to be outrageously Pakistani: own at least one cricket team shirt (or at least something that matches the murky green of our flag), casually hate on India, think your city is the best city in the world – even though it’s likely that pollution, gruelling poverty, shoddy sanitation systems, and a lack of green spaces leave much to be desired – among other performances. At a glance, that might seem like a largely harmless sentiment to hold, but over a sustained period of time these behaviours become overwhelmingly sinister in nature. What might be intended as a means of inclusion, a way to build community, can leave a lot of people feeling alienated in a place that’s supposed to be “home”. 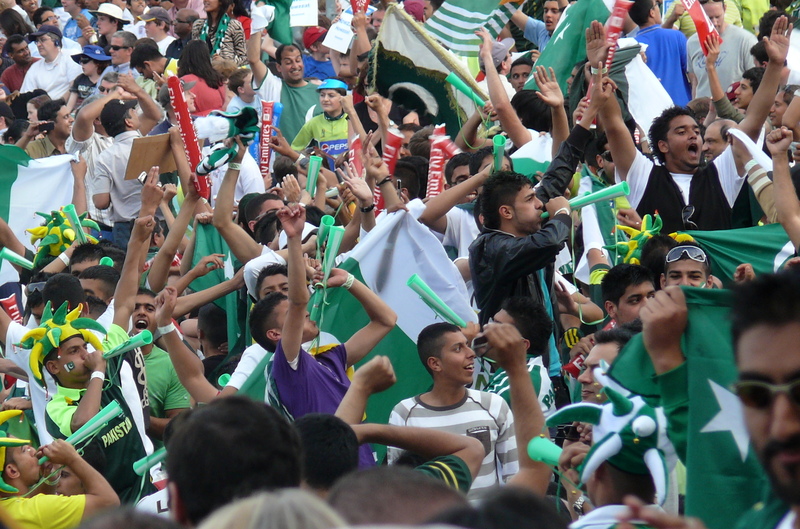 Pakistani cricket fans cheering with green airhorns at a match. Source: user JJ Hall on Flickr. I put quotation marks around the word “home” because I still don’t understand what the word really means. Is “home” a feeling, somewhere you can be yourself, or somewhere you can speak your own language? Is it somewhere you’re at ease, accepted by others who you believe share your values and worldview? Or is “home” simply a place you go back to once per year to see your parents? It’s no wonder this feeling of disconnect exists in many of us. It’s the story of every post-colonial nation – a warped identity, with influence from the outside world being both integrated and fiercely opposed at the same time. Colonisation brought us railways and the English language, with the storm of globalisation came McDonald’s and American TV. Children of the elite began attending schools where the instruction was primarily in English, the native Urdu designated its own special, solitary class. I grew up watching the Powerpuff Girls, adopting American and British colloquialisms, reading Shakespeare in literature class, and learning English terms like “chain reaction” and “osmosis” without ever learning their Urdu equivalents. Speaking English meant bearing the seal of education – bonus points if you were able to smooth out the harsh Ts and Ds of your native accent. To deal with this phenomenon, the phrase burger bacha (burger kid) emerged, formulated to poke fun at “Westernised” youth. It’s a half-serious, mostly-joking term alluding to the notion that privileged kids would likely choose a Big Mac over the classic shami burger – a toasted burger bun with an egg and chutney patty, a beloved staple of Pakistani street food. The term hinted at the discomfort many felt about what was seen as a rejection of the local culture, and the inequality that allowed burger bachay to opt for the Big Mac in the first place. I won’t deny it: I am one of those burger bachay. I speak, read, and write in English better than I do in Urdu. I am acutely aware of the role Western cultural hegemony and colonial superstructures have played in my life. I have to remind myself just how privileged I am to be able to do that, in order to keep my elitism in check. I never felt fully committed to the idea of loving a country that made me feel like I failed at being a “true Pakistani”. I didn’t really care for cricket, nor did I find the idea of singing the national anthem particularly appealing. As I grew older, I began to notice more of the tragedies of governance that my privileged childhood had afforded me the luxury to ignore, which only served to make me more disillusioned. Being a woman, a minority, a liberal or simply being poor means that you are, to some degree, excluded from the “unity” part of the Pakistani national motto, “Faith, Unity, Discipline”. 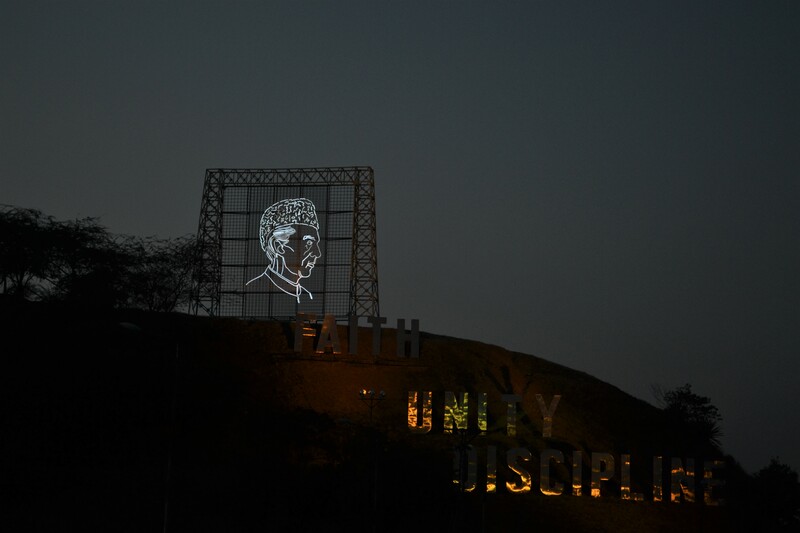 The words of the Pakistani motto along with a drawing of Pakistan’s founder Quaid-e-Azam on a hill beside Islamabad Highway. Source: user Khalid Mahmood on Wikimedia Commons. Dissidents who speak up against the status quo are not only endangered by law and ostracised by the media, they are often horrifically murdered by the same society they had hoped to better. Women who do not conform to the crushing ideals of purity and honour, defined by increasingly murky politics of shame, often meet the same fate. Critics who stand against the actions of the armed forces, shed light on the shady dealings of government or stand up for the rights of the marginalised are often derided by the public, with social media pundits declaring them “Indian agents” or accusing their politics of having a “Western agenda” – even after they die. The popular worldview among Pakistanis would have you believe that the entire planet is involved in a conspiracy against Pakistan. Even Malala Yousafzai, the youngest Nobel Peace Prize winner and international poster-child for overcoming adversity, has faced some of the harshest vitriol from Pakistani nationalists (as well as explicit death threats) to the extent that a book entitled I Am Not Malala was published, with the supporting tagline ‘I am Muslim. I am Pakistani’ emblazoned across its cover – a sharp jab at Malala’s own autobiography, I Am Malala. Grown men have sat on national television and accused Malala of being a foreign agent sent to unleash a negative image of Pakistan. One would assume she’s doing the opposite, but really it would be remiss to start looking for logic where there isn’t any. 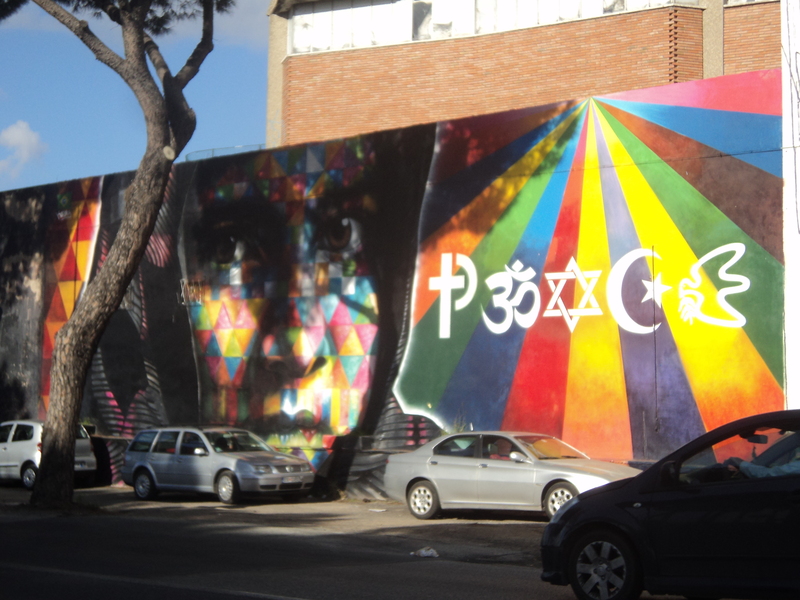 A mural dedicated to Malala in Rome. Source: user Nicholas Gemini on Wikimedia Commons. What’s the common thread in all of these cases? At some level, the wider Pakistani public considers these people to be traitors for speaking out about the ills of the country. When nationalism courses so deeply through our veins, an attack on one of our parts seems, to many, like an attack on the whole country. Here, simplistic binaries rule supreme. Us vs. Them, Good vs. Bad, Pakistan vs. India, Beautiful vs. Ugly — these things cannot coexist, according to the nationalists. We are a nation obsessed with “character” and we’ve assigned one to our own country that we’ll fiercely protect. Any attention drawn to its less-than-savoury aspects is immediately met with an accusation that you are trying to profit, somehow, from showing a pessimistic image of Pakistan to the rest of the world. Talking about miscarriages of justice or gross violations of human rights seems to be considered worse than the crime itself. I suppose this insecurity stems from the gruesome and admittedly unbalanced way that Pakistan is routinely covered by international news media, but that is no excuse. It is ridiculous to care more about the image of Pakistan than the state of it. The rampant and exclusive nationalism of Pakistan has driven hordes of people out of the country. We continue to lose those who have the gall to criticise, condemning them with the powerful popular sentiment that they’re ungrateful, and therefore unwelcome. We never stop to think, not even for a second, that perhaps these people criticise because they want things to improve. We don’t stop ourselves in the midst of this powerful sentiment to think that maybe the best way for someone to show love for a country is to want for it, very deeply, to do better. Instead we plough forward with thoughtless ease, while our country crumbles behind us. Abeera Atif is GSBTB’s Communications Assistant.